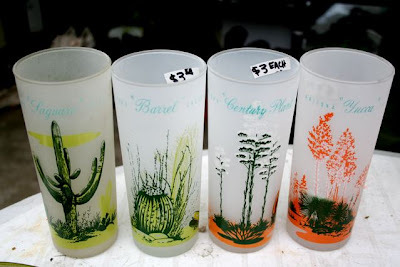 The “Blog” of “Unnecessary” Quotation Marks: "Yucca"
Just to be clear, on these shot glasses are not actual desert plants, but depictions thereof. Or depictions approximating said plants. Thanks, Charles. Ceci n'est pas une "yucca". Given that these are the common names for these cacti rather than the Latin names, quotes are probably appropriate. i have these glasses! they're not shot glasses though. more like iced tea glasses. the approximate age of space?